Scleractinian corals experience a wide range of flow regimes which, coupled with colony morphology, can affect the ability of corals to capture zooplankton and other particulate materials. We used a field enclosure oriented parallel to prevailing oscillatory flow on the forereef at Discovery Bay, Jamaica, to investigate rates of zooplankton capture by corals of varying morphology and polyp size under realistic flow speeds. Experiments were carried out from 1989 to 1992. Particles (Artemia salina cysts) and naturally occurring zooplankton attracted into the enclosures were used as prey for the corals Madracis mirabilis (Duchassaing and Michelotti) (narrow branches, small polyps), Montastrea cavernosa (Linnaeus) (mounding, large polyps), and Porites porites (Pallas) (wide branches, small polyps). This design allowed corals to be used without removing them or their prey from the reef environment, and avoided contact of zooplankton with net surfaces. 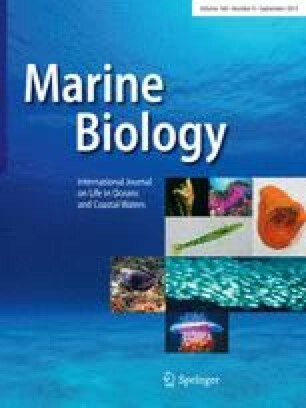 Flow speed had significant effects on capture rate for cysts (M. mirabilis), total zooplankton (M. mirabilis, M. cavernosa), and non-copepod zooplankton (M. mirabilis). Zooplankton prey capture increased with prey concentration for M. mirabilis and M. cavernosa, over a broad range of concentrations, indicating that saturation of the feeding response had not occurred until prey density was over 104 items m−3, a concentration at least an order of magnitude greater than the normal range of reef zooplankton concentrations. Location of cyst capture on coral surfaces was not uniform; for M. cavernosa, sides and tops of mounds captured most particles, and for P. porites, capture was greatest near branch tops, but was close to uniform for M. mirabilis branches in all flow conditions. The present study confirms laboratory flume results, and field results for other species, suggesting that many coral species experience particle flux and encounter rate limitations at low flow speeds, decreasing potential zooplankton capture rates.